Kurt Busch survived the chaos of the Bristol Night Race on Saturday to capture his sixth career win at Bristol Motor Speedway — and his first since 2006. Busch led the final 24 laps of the 500-lap, 266.5-mile race in his No. 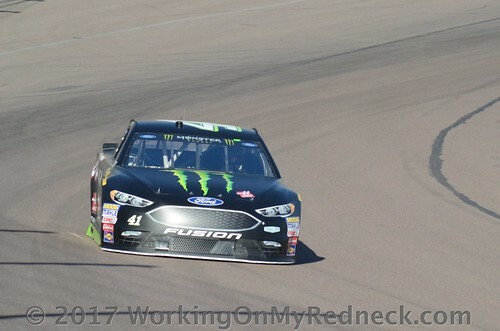 41 Stewart-Haas Racing Ford for his first victory of 2018. None of our players selected Kurt Busch this week as their dark horse winner for the last race in the second segment! Either they had already used up their “Outlaw” pick earlier in the segment, or they had just given up on Busch The Elder this year. So this award will go back into closet till the 3rd segment opens up at “The Track Too Tough To Tame”, aka Darlington. KuBu had not scored a victory since his 2017 Daytona 500 victory to start that year off. It may be reasonable to think that the12-year drought at Bristol may have been cause for Kurt, possibly, to hum an old Lady Gaga tune when he rolled into the track and saw the winner’s trophy this weekend. Slightly more than one-quarter of The Redneck Fantasy League ended the second segment pooling their choices on a driver who has finished second to Kyle Busch about a half a dozen times! I am not sure if those six players “COLLUDED”, or was it just a huge coincidence! Nevertheless, Jeremy The Coach, Amber The Extremely Lucky Cheddar Head, Edie The Las Vegas Super Star, Jim, aka Chiefy, Bernie The Bay Area Bandit, as well as Linda B. The Cookie Mom were all hoping that when “Young Money” pitted with 12 laps to go for a splash of gas and four “fresh feel goods”, he would drive right on by the leader, KuBu for the victory. Our points leader and 3rd segment winner, Lonna The Quilt Angel partnered with Jeremy The Coach in supporting Team Penske’s newest driver, Ryan Blaney. Blaney ran fairly strong all race, finishing in 7th place and delivering 46 points for these individuals. Meanwhile, Karen The Highly Opinionated Southern Belle and Doug The Gandy Candy Man were hanging with “Sliced Bread”, Joey Logano, this week. During the middle part of the race, it looked like “Sliced Bread” may have the car to beat. But as we have witnessed from time to time, the car that is really good in the early part of a night race sometimes fades during the later portion of the race. But Logano delivered 45 points for these two players. Zee, aka Sissy, ended her segment scoring 39 points when Eric Jones crossed the finish line in 5th place. Finally, Leon Your Most Humble Sheriff snuck in as the fifth highest scorer of the week. The Sheriff was really hoping that Mr. Seven-Time, Jimmie Johnson, could drive his hot rod up on the second floor of the media center to Victory Lane at Bristol. Johnson failed to hoist the hardware again this week, but he did grab a 9th place finish and deliver 32 much-needed points to The Sheriff, who has been in a huge freefall for the last four races! Because of the closeness of the scores throughout the leaderboard, twenty of the twenty-two players changed places. the only two players who remained in their previous position was Lonna the Quilt Angel and Zee, aka Sissy. The biggest mover in the final week of segment #2 is Bobby Blue Crush. Ol Blue Crush plummeted six (6) places to finish off this segment landing in a tie for 12th position with Doug the Gandy Candy Man. Edie The Las Vegas Super Star and Kathy The Church Forecloser each moved five (5) places. The Las Vegas Super Star ended the segment on a big positive note climbing up to 10th place. The same cannot be said for The Church Forecloser this week. No, The Forcloser ended the segment on a big downward slide to land in 17th place. Next up is a group of six players that moved three (3) spots. Those six players include Jim, aka Chiefy, Jeremy The Coach, Karen the Highly Opinionated Southern Belle, Doug The Mongoose, Leon Your Most Humble Sheriff, as well as Carole, aka Rudy. Four of these players, Chiefy, The Coach, The Highly opinionated One, and The Gandy Candy Man, ended the segment on a positive note moving up to land in 4th, 5th, 11th, and 13th, respectively. However, Your Most Humble Sheriff and Rudy dropped like a hot potato landing in 15th and 16th, respectively. Meanwhile, Dan the Numbers Cruncher, Linda R. The Lemonade Lefty, Bernie The Bay Area Bandit, Jerry The Buschwacker and David The Mudslinging Throttle Jockey all moved two (2) spots. The Bay Area Bandit and The Buschwacker moved positively this week steeping to 8th and 9th, respectively. However, The Numbers Dude, The Lemonade Lefty, and The Throttle Jockey all fell down to end up in 6th, 7th, and 19th, respectively. Rounding out the top five movers this week is a group of seven players that include Amber The Cheddar Head, Carlton The Doorman, Kathy The Church Forecloser, Linda B. The Cookie Mom, Skid-Marc, and A&M Aggie Sue. The Cheddar Head, The Church Forecloser, The Cookie Mom, as well as Ol Skid-Marc stepped up one position ending their segment in 2nd, 17th, 18th, and 21st place. Whereas The Doorman and Aggie Sue fell one spot to land in 3rd and 22nd place, respectively. A&M Aggie Sue single-handedly wins “The Crappiest Pick of The Week” award with her single-digit score of 7 points. A&M Aggie Sue ended the segment with a “big run” on “The Outhouse”! She was successful in evicting Ol Skid-Marc out of his warm fuzzy comfort zone, and taking over The Outhouse!